Built in 1910 and owned by the River Oaks Garden Club since 1942, the Forum of Civics building is of recognized historical significance and is listed in the National Register of Historic Places. Its gardens provide valuable green space in the heart of the city and are open to the public free of charge. Initially built for use as a county school, the building was remodeled in 1927 by John F Staub as headquarters for the Forum of Civics founded by Will Hogg. Hogg, who chaired the Houston Planning Commission, organized the Forum of Civics to develop a comprehensive plan for Houston’s public spaces and, in his words, “to stimulate civic pride and to combine forces for the betterment and beautification of Houston.” One of the Forum’s projects was the citywide planting of crepe myrtles, roses, and shade trees, all of which were donated by Will Hogg. The Hogg estate bequeathed the building to the University of Texas in 1939 with the stipulation that it continue to be used for educational purposes. 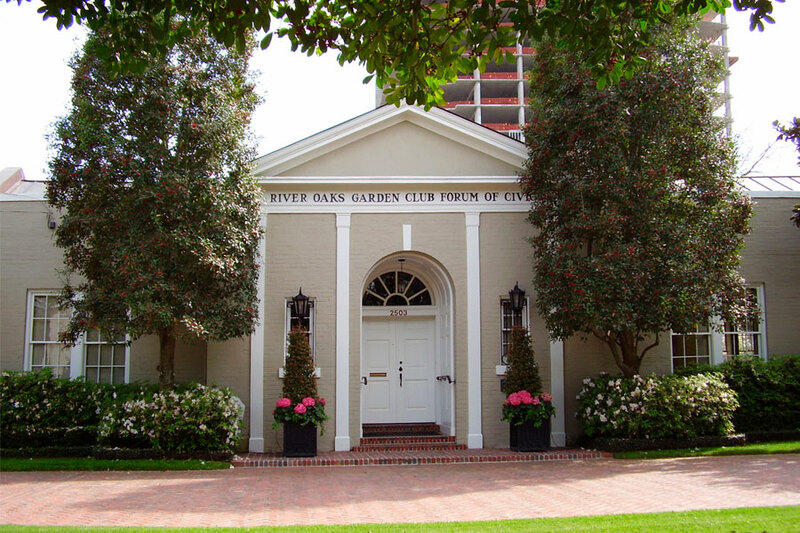 When the River Oaks Garden Club purchased the Forum of Civics building, the UT Board of Regents stipulated that the Club “carry on the educational work directed primarily to stimulating knowledge and love of gardening, aiding in the protection of native plants and birds, and encouraging civic planting and planning.” In the ensuing years, the River Oaks Garden Club has carried out this charge. The Forum building has been home to horticultural workshops, flower shows, and in conjunction with the annual Azalea Trail, educational exhibits. The Club has also established model gardens on the Forum grounds for demonstration purposes. The first such garden, a Victory Garden, was planted during World War II to encourage Houstonians to grow their own vegetables. In 1955, three formal gardens designed by J. Allen Myers, Jr. and Herbert Skogland were installed. The club later installed two additional, more informal gardens: one of native Texas plants, and another of seasonal plantings.